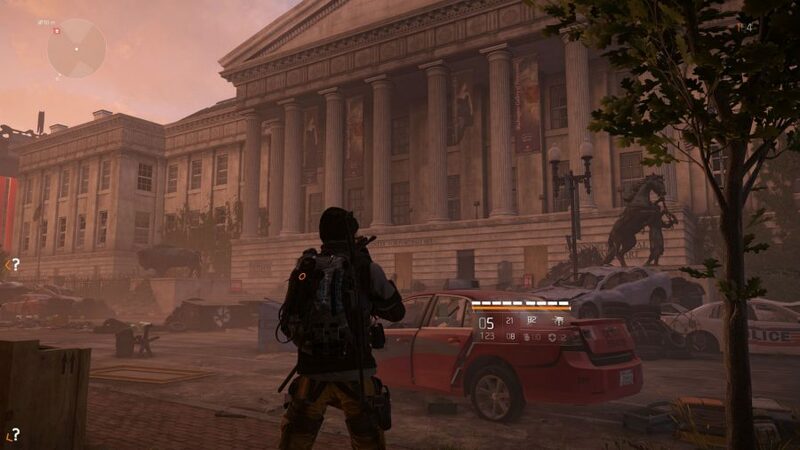 The Division 2 is huge. But unlike so many open-world games, every inch of its enormous approximation of downtown Washington, D.C. is brimming with activity. Raccoons pick through bins, deer spring through the streets, and clusters of survivors can be spotted gathering supplies or battling hostile factions. 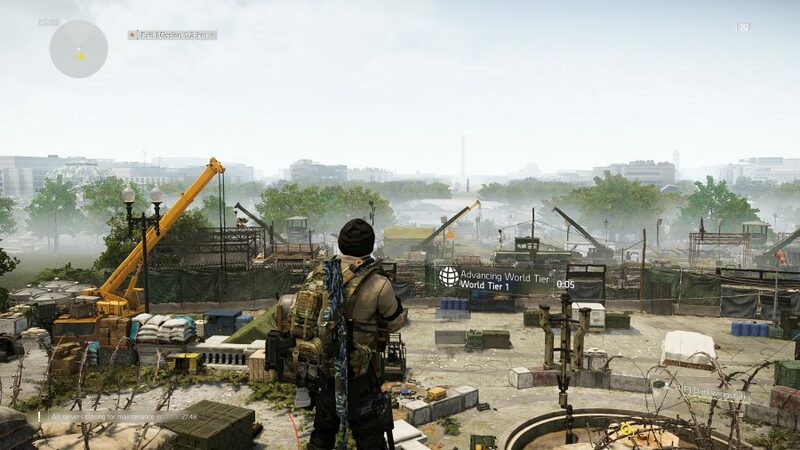 All of this goes on without you, but where The Division 2 really draws you in is when you slow down the grind for better gear and spend a little time exploring the world, helping out its struggling denizens as you go. Wander over to a group of friendly survivors and they’ll react to your presence, buoyed by the fact that they have a Division Agent backing them up. These NPCs roam the city with actual purpose, so you’ll often stumble across a group who are on their way to gather food and be able to lend a hand. These encounters aren’t initiated through a mission marker or key prompt, though. Instead you might overhear someone voicing concern about venturing into an alleyway covered in graffiti markings from an enemy faction. Step closer and one of the survivors will call you over, telling their comrades it will all be okay because they have a Division Agent with them. Sure enough, when they charge into the alleyway and a skirmish ensues, if you pitch in with a kill or two they’ll also gather up the resources they came for and head back to the nearest settlement. While the narrative that’s delivered through the main campaign missions and cutscenes is practically non-existent, the anecdotes gathered through joining up with groups of scavengers more than filled that gap. That’s not to say the main missions aren’t good, however – in fact, they feature some of the most memorable locations of any third-person action game in recent memory. I was hooked playing through each one, eagerly anticipating every new room and the battles that would unfold there. Throughout the campaign I’ve fought in the National Air and Space Museum, an underground nuclear bunker, Capitol Building, the American History Museum, a television studio, and – most haunting of all – a facility for processing and disposing of contaminated bodies. That last one is still bugging me, picking through rooms where body bags are stacked up to the ceiling and pouring out of elevators – it’s a punchy, unsettling reminder of why the streets are so empty. So far, I’ve managed to clock up over 50 hours in The Division 2, which breaks down roughly into 20 hours spent with the main campaign, ten hours working up to max level, and another 20 hours wading through endgame content and dabbling with PvP. It’s important to stress that I’m still having a blast with the game. I’m still looking forward to every loot drop, still steaming into street skirmishes as soon as I hear gunfire, and still discovering new and interesting locations across Washington, D.C. Compare the experience to Anthem’s stodgy first steps and there’s a gulf where quality-of-life features are concerned. You can change the bulk of your The Division 2 build while in combat, you only encounter loading screens when you first enter the game or fast travel, you very rarely have to visit quest givers, and when you do the game doesn’t force you to march around the whole settlement at jogging speed. It’s odd to sink so many hours into a game in such a short time and still be enjoying every minute of it. 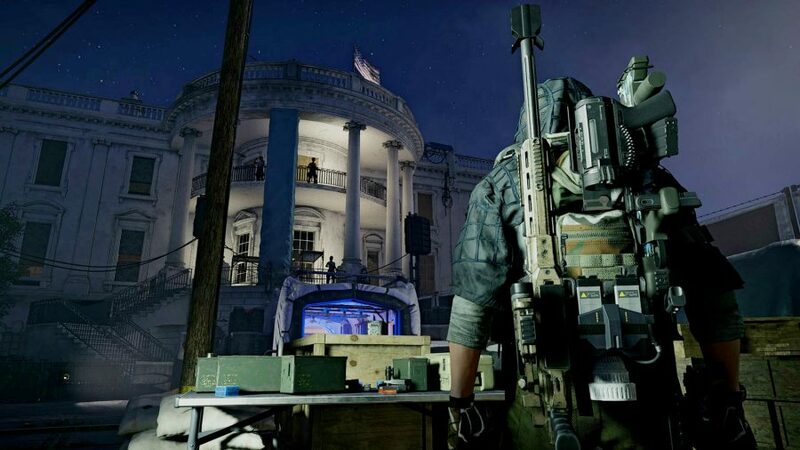 A lot of this comes down to the core gameplay experience: Ubisoft and Massive Entertainment have made an exceptional cover shooter in The Division 2. 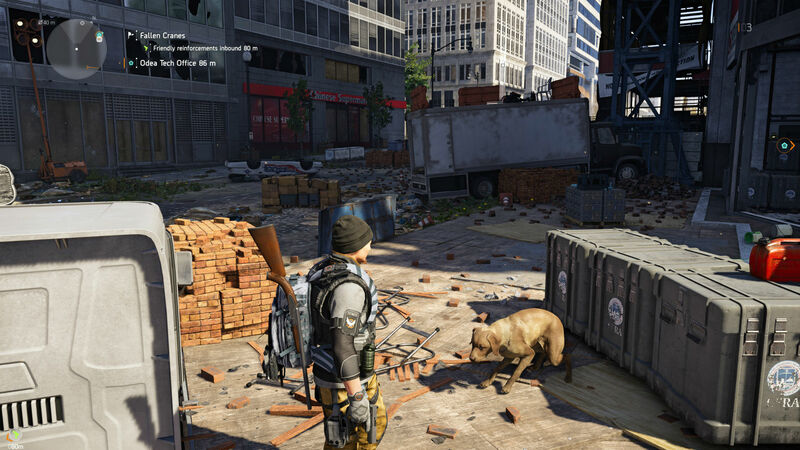 Whether fighting in the confines of the Grand Washington Hotel or in the wide open boulevards of the Federal Triangle, duking it out with the game’s tough AI enemies is a constant delight. Each of the three enemy factions – Hyenas, True Sons, and Outcasts – boasts a bespoke set of tactics and kit that keeps every fight feeling fresh and dynamic. Hyenas prefer to rush and flank with reckless abandon, hurling a steady stream of drugged-out melee grunts after you so you can never settle behind a single piece of cover. The True Sons make the most of their advanced military hardware, deploying heavily armoured elites with LMGs who set up bipods and rain bullets on you while their allies cleverly surround your position. The Outcasts are the most volatile of the lot, mixing the sheer aggression and tempo of the Hyenas with dastardly tactics. These include deploying RC cars that have buzzsaws strapped to them – eat your heart out, Robot Wars – suicide bombers, and flamethrowers. Out in the open world you can even interrupt fights between two factions, which are gratuitously messy. Weapons are punchy and enemies react to every shot, collapsing into a convincing ragdoll as soon as you land the killing blow. There’s a clear emphasis on your skill here, too, rather than combat coming down to gear stats alone. Every enemy has a weak spot that can be targeted to instantly put them on the back foot, while armoured enemies are just as squishy as a standard grunt after you shoot off a piece of their cladding. This helps ground the combat in a game where elite enemies and bosses show up all the time. Overall, time to kill is relatively short compared to the first game, and if you can place your shots it’s possible to down clusters of baddies with a single round. Every conflict feels like a delicate balancing act where you’re always looking out for potential flanking enemies or desperately holding out for one of your skills to cooldown so you can turn the tide of the fight in your favour. I’ve not had the time to play around with every skill and variant yet, but the Incinerator Turret and Oxidizer Chem Launcher have become my offensive go-to. The turret can be placed on the floor and spews out a stream of fire that burns any enemies caught in its path – it’s great for countering rushers and securing a corridor while you focus your gunfire elsewhere. As for the Oxidizer, a single canister will tear off most of a boss’s armour, allowing you to quickly take down a heavy before they can start influencing a fight. Naturally, this shines when fighting alongside other players, especially when your skills compliment one another. For example, directing two healing gadgets at a teammate and sending them into the fray with nothing but two high-damage shotguns, Leeroy Jenkins-style. Endgame amps up the challenge significantly. It introduces a new faction, the Black Tusks, who add a few fresh gadgets for you to figure out, such as Boston Dynamics robots mounted with cannons and exploding drones that home in on you. The arrival of the Black Tusks ushers in a new storyline – albeit one that’s just as insipid as the narrative of the main game – and the group invades all main missions and strongholds. This provides you with a new foe to tackle, but also shifts enemy spawn locations around in each mission and tweaks individual objectives slightly to keep you on your toes. There are also new world events to ensure that everything feels a little different, too. The highlight discovery so far are Chinook-sized drones marauding the skies, laying waste to enemy factions with missiles and miniguns. Take one down and you can expect a decent haul of loot for your troubles, plus the bullet-hell inspired U-turn in gameplay they provide is a lot of fun. 20 hours into the endgame grind and the world is still offering up neat surprises like this, so I’m very excited to see what the upcoming Tidal Basin stronghold and eight-player raids will throw at me. 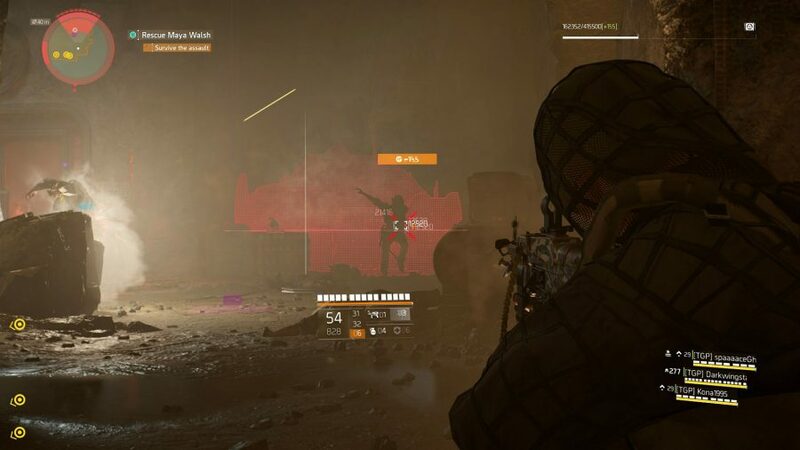 The Dark Zone returns from the first game, although a few key tweaks help level the playing field in favour of ordinary players rather than the gankers who’ve poured all their efforts into making the lives of others miserable. For starters, there are now three Dark Zones instead of one, offering players a chance to escape particularly troublesome crews for a laid back DZ elsewhere. 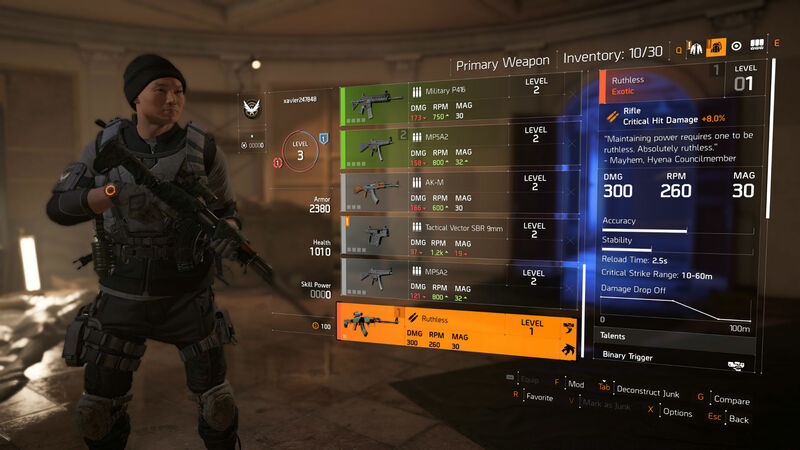 An Occupied Dark Zone rotates around the three DZs for PvP purists who want every aid disabled: no gear normalization, friendly-fire off, and no way to tell if other Agents have gone Rogue. 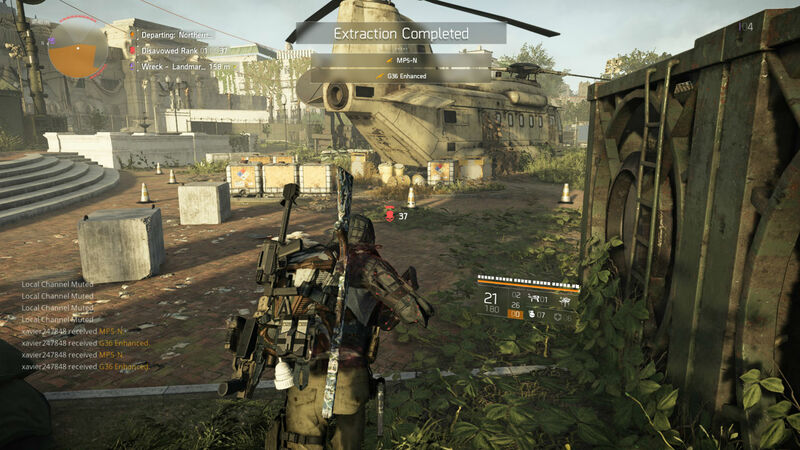 I’ve spent a few hours in the various Dark Zones, conquering PvE landmarks, extracting loot, picking fights with other Agents, and mostly getting my posterior handed to me. When the fight is fair, the Dark Zone feels like a real hunting ground that rewards patient play and good positioning, but too often my plans were scuppered by a squad of Rogues who could surround and kill my buddy and I in a matter of seconds. Thankfully, there’s Manhunt status, which kicks in after the offending group slay one too many Agents, placing a hefty bounty on their head and marking their positions on the map for all to see. Within minutes the entire server has descended on the four doomed players, completely overwhelming them with firepower, and quickly retaking any ill-gotten loot. Once the Manhunt is over I stick with a couple of duos and as a makeshift gang of six we take it in turns to extract our loot, safe in the knowledge that we can defend ourselves should the Rogue squad return. The Dark Zone is a great story generator, but a few issues mar the experience, such as a tendency for AI enemies to spawn in right behind you when you’re in the middle of a skirmish. There’s also the inherent handicap you’ll face if you enter the DZ without a full complement of allies. Away from the Dark Zone there’s Conflict PvP, which can a fun distraction and pretty tense when the teams are evenly balanced. However, when they’re not balanced, and you’re up against a good squad with carefully constructed PvP builds, things can get very miserable. Gear normalization seems to have little effect when it comes to leveling the playing field, and while the rewards from Conflict are reasonably generous, there’s little about the experience that I find myself wanting to return to. Your build absolutely matters in PvP, and if investing tens of hours squeezing every last drop of damage out of your gear isn’t something you like the sound of, then you probably won’t find much joy here. A substantial evolution on the mechanics of the first game, sporting a more immersive world to boot. This is an impressively complete game, with heaps to offer players across all of its content prongs and a level of polish that belies the size of the game’s open world. Sure, it’s story is utterly forgettable, but every other aspect has been tuned to near-perfection. Better still, with a year of free DLC planned, it would appear players have a lot to look forward to over the game’s lifetime.